Coral is made from a multicoloured tie-dyed material. She has black button eyes and two small fins on either side of her round body. A dorsal fin runs along her back and she has a triangular tail fin. These colors were chosen just for you! Coral was released on 3rd June 1995. Her birthday is on 2nd March 1995. Coral is made from the same fabric as Garcia the bear. She has been spotted with a Ziggy tush tag. 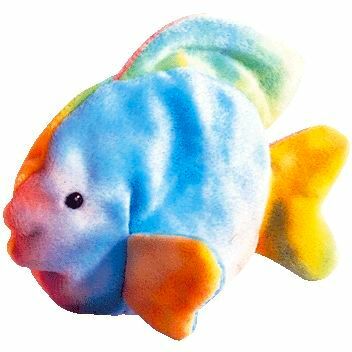 Coral was also released as a larger Beanie Buddy and as a McDonald’s Teenie Beanie Baby. She was retired on 1st January 1997.